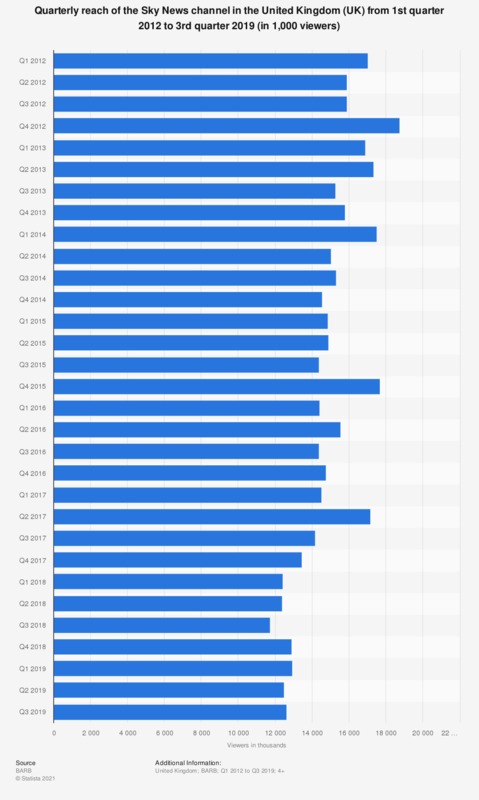 This statistic shows the quarterly reach of the Sky News television channel in the United Kingdom (UK) from the first quarter of 2012 to the fourth quarter of 2018. During the period of consideration, Sky News reached a peak in the fourth quarter of 2012 at 18.8 million viewers, falling down to its lowest ever value in quarter three 2018 at 11.7 million viewers. Sky News is a relatively new news broadcast network, which was first released in 1989 and was released under the Fox Network. The network is broadcast worldwide apart from in New Zealand and Australia. The network provides information to its customers through a variety of medium such as mobile and internet broadcasts. The slogan for the network is 'First for breaking news'.